Michael Golding and his family arrived in Sydney from Ireland in 1840 as assisted migrants. He was a carpenter and joiner but within a few years he had modified his surname and his trade: by 1850 he was an “architect”. Michael Golden was appointed Superintendent of the Building Act, 3 May 1847. Later his title became Surveyor of Buildings. Collingwood notes that in support of his application for the position, Golden offered, in lieu of qualifications or experience, acquaintance with some of the city councillors. 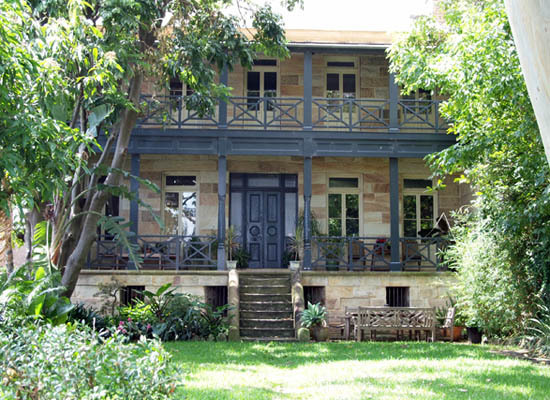 Smith states that in 1855 “Michael Golden purchased the two acres on which Margaretta Cottage and Leichhardt Lodge now stand and he may have designed both”. He dates the cottage as later on the basis of the detailing of the chimney stacks. When he died in 1872 Michael Golden was a landholder of substance. He owned much of Leichhardt Street in Glebe as well as eight houses near Bathurst Street in the city. Solling notes that the subdivision of the Golden Estate in 1908 released narrow-fronted building lots in Cook and Leichhardt Streets.